Water damage is a nightmare for many home owners especially if they don’t know the cause of the problem. The situation is really devastating if the water continues to rise and you don’t know what else to do about it. If you have not discovered where the source of the water damage is coming from, you may need to find a professional to help you. Some of the pipes in your home are concealed and you can never determine the reason of the waters lingering in your home until the professionals will do the searching for you. They have the right tools and equipment to make the process quicker. When it comes to water damage it is important for you to be aware of the phases that you need to deal with before you can get your life back to normal. These three stages are also the most important jobs that water damage restoration service firms can provide to homeowners. The very first thing that you should do when you experience leaking or water problems in your home is to turn the power off. This is very important especially if you don’t know where the water comes from. Once the water damage restoration company inspected your property they will be removing the standing water first. The removal of the excess water is the first process they will do. This stage also covers the removal of saturated materials like the damage sheetrock, carpet pad and insulation. The professional contractor will have the right equipment to do this. Professional repair company will have the right manpower to handle this process. They will use a special air movers and dehumidifier for fast drying. This works when the dehumidifier generates super dry air which is directly applied to the affected area with powerful air moves. This air will take moisture out of the structure to dry. High moisture in the air can cause building materials to warp, paints to peel and molds to grow. Drying the structural material of the affected area and removing all the moisture in the air is very important in reducing the possible damages that might occur during the cleaning process. Once the structure is completely dried your contractor will now help you restore back the normal function of the affected area. They may remove cover base or baseboards and drill holes to ensure that the wall cavities are also dry. The damage sheetrock in the ceiling will be repaired and other items that were damaged by water beyond repair will be replaced. 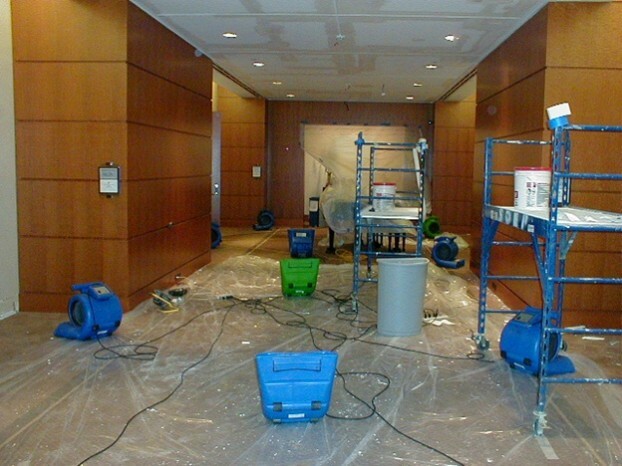 Most of the water repair contractors who will provide the removal and drying services may also provide water damage repair. The water damage restoration company offers these services in order to help homeowners in the cleaning process after a flooding or water problem strikes their home. The removal, drying and the repair are the three most important steps in restoring the appearance of your property and your normal life. Andy is the president of a water damage restoration company. His years of experience in the field enable him to teach people on how to maintain their property after a flooding. He also writes a book about water damage restoration to reach out to people who have not tried the services.